As of 8:15 pm tonight…. McCain declared the winner by CNN with only 12% return. Foregone conclusion, but I can’t tell you how happy I am that Mitt Romney has been slowly slaughtered in this race. Clinton is actually making a race of this thing today. Though Obama has had superstar power in the past 5 days, I’m astounded that Clinton has this strong a showing. Anyone else watching the ‘Greatest Political Team on Television’? 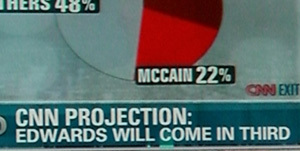 They’ve claimed John Edwards is coming in third. Great analysis guys. Good thing I have 3:10 to Yuma from Netflix.